The market share of plug-in electric cars in Canada appears to have topped 1 percent for the first time ever last month. Final sales totals won’t be available until registration data arrives later this month. We estimate that just under 1,900 vehicles with plugs were sold last month, compared to roughly 187,000 sales across the country of all new vehicles. We got that total by adding reported September sales (943) to an approximation of 400 Tesla sales (June's number, since like September it was a quarter-ending month), plus the average of the last four months’ estimated registrations and sales estimates for all other plug-in models (550). 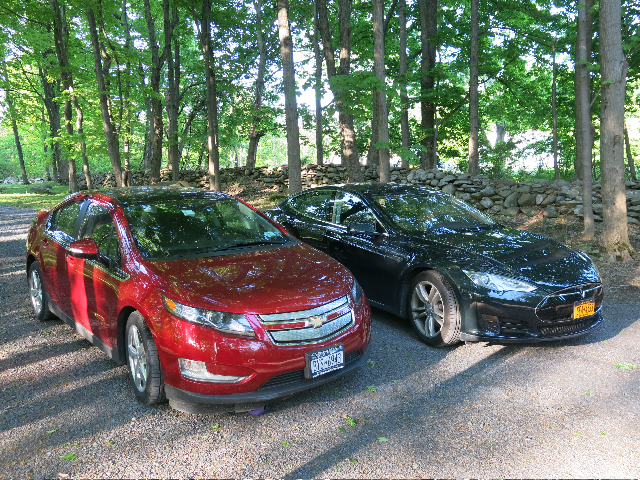 The charge was—as usual—led by the Chevy Volt, whose 483 sales set a new monthly plug-in electric vehicle record for the country. That number beat the 446 Volts sold last September. Still, it's a sign of the modest size of the electric-car segment that its leader still isn’t among the country’s top 100 best-selling vehicles. The Volt ranked 119th in Canada last year, according to GoodCarBadCar.net. The Chevrolet Bolt EV, the Volt’s all-electric cousin, enjoyed its second-best sales month in September: 227 Bolts were sold, nearly triple the 82 delivered in August. March remains the high-water mark for the Bolt EV at 241 units. Nevertheless, the Bolt could outsell both the Tesla Model S and Model X this year, despite its late-January introduction. With Canadian inventories of the first-generation Leaf dwindling before its successor arrives early next year, Nissan sold only 19 Leafs in September. The current year will mark the first time Leaf sales in Canada have declined over the previous year, though it's reasonable to expect a healthy showing next year from a redesigned 2018 Nissan Leaf with 140 miles of range. Volkswagen sold 122 e-Golfs in Canada in September, its best showing to date, while Toyota sold 88 Prius Prime plug-in hybrids in Quebec. These figures represent 5 percent of the Golfs sold in Canada each month, but more than half of the Prius hybrids sold in Quebec—which is to say the Prius Prime has outsold the conventional Prius hybrid since its June introduction. 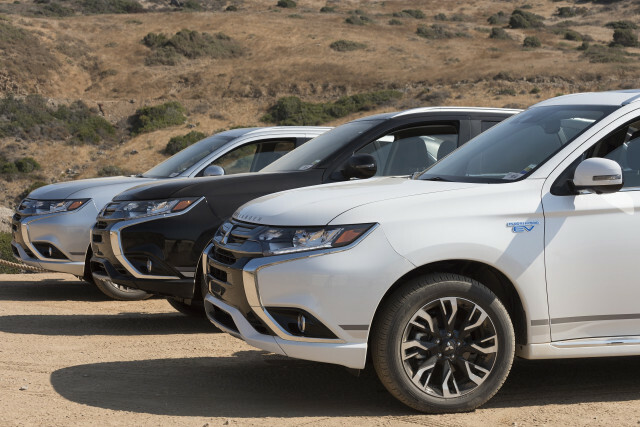 Mitsubishi sold 4 i-MiEV minicars in September, as the company’s focus shifts to the Outlander PHEV, arriving in December. 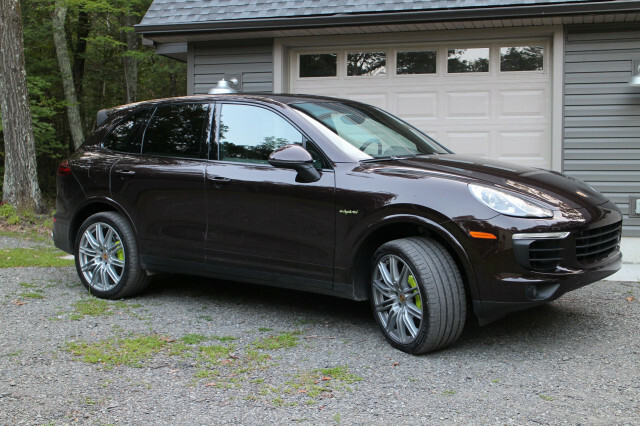 That plug-in hybrid SUV's first-year sales alone will likely surpass the i-MiEV’s 768 lifetime sales. 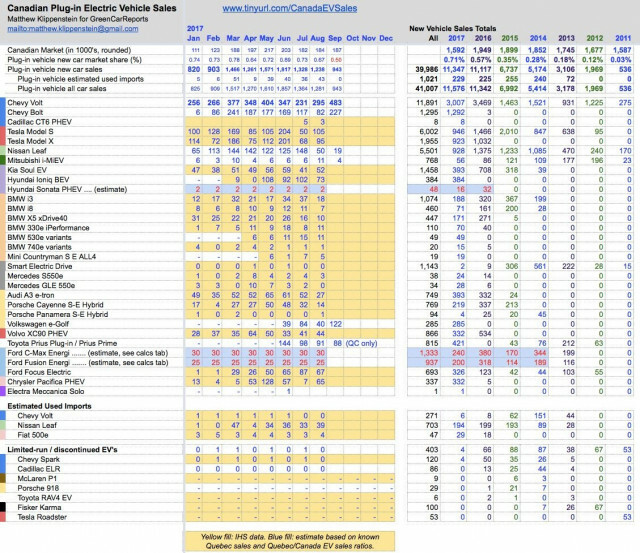 As always, Ford C-Max Energi, Ford Fusion Energi, and Hyundai Sonata PHEV sales are minimal. Canadian plug-in electric vehicle sales in August were estimated at 1,248, down slightly from July’s 1,328. Market share was 0.67 percent versus August’s 0.73 percent. The Tesla Model S logged 105 registrations in August, up from 50 in July,. Tesla Model X sales rebounded from 68 to 95. The Hyundai Ioniq Electric sold 73 units, down slightly from 102 in July, while Kia sold 52 Soul EVs, up from 41. The 65 Chrysler Pacifica Hybrid minivan sales were roughly even with June; July sales dipped due to a recall-related production stoppage. Ford sold 76 Focus Electrics, almost as many in 2017 (326 over eight months) as were sold in the prior five years combined (367). An estimated 39 used Nissan Leafs and 4 Fiat 500e electric hatchbacks were imported from the United States as well. Among luxury brands, Audi sold 27 A3 e-trons in August, its lowest sales in almost a year, while Porsche sold 14 Cayenne S-E Hybrids and a Panamera S-E Hybrid. Mercedes-Benz added 3 more S550e plug-in hybrid sedans, while Volvo sold 44 XC90 plug-in hybrid SUVs. BMW sold 18 i3 electric hatchbacks, 7 i8 plug-in hybrid coupes. Sales of its plug-in hybrid versions of conventional vehicles were 10 X5 xDrive40 SUVs, 11 330e and 11 530e sedans, one 740e large sedan, and four Mini Countryman S E ALL4 small crossovers.